As firmware updates and larger media files become more prevalent in automotive entertainment consoles, faster data rates are required to reduce upload and download times. 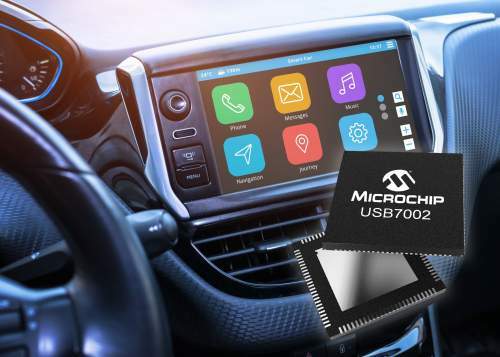 Microchip Technology Inc. (Nasdaq: MCHP) today announced an automotive-qualified USB 3.1 Gen1 SmartHub IC, offering up to 10 times faster data rates over existing USB 2.0 solutions and reducing indexing times to improve the user experience in vehicles. To support the rising adoption of USB Type-C in the smartphone market and enable universal connectivity in vehicles, the USB7002 SmartHub IC includes interfaces for USB Type-C connectors. To support the driver assistance applications that are now standard on all mobile handsets, the SmartHub ICs also include Microchip’s patented FlexConnect technology, which provides the unique ability to dynamically swap between a USB host and USB device. The SmartHub ICs also feature patented multi-host end-point reflector technology, which enables USB data to be mirrored between two USB hosts. These fundamental features enable the graphical user interface of a phone to be displayed on the vehicle’s screen and integrate with voice commands inside the car, while simultaneously charging the mobile device. This allows consumers to easily and safely use their mobile devices while driving, providing a user-friendly way to make calls, send messages and get directions while focusing on the road. The USB7002 IC comes with a complete solution including the MPLAB® Connect Configurator hub configuration tool, evaluation boards with schematics and gerbers to reduce development time. Microchip’s USBCheck™ services allow manufacturers to verify designs and layouts prior to sending out a PCB for manufacturing, significantly accelerating time to market for their end products.